For a long time, patients suffering from non-melanoma skin cancers such as basal cell carcinoma and squamous cell carcinoma only had one option to turn to for successful treatment. Mohs surgery, developed by general surgeon Frederik E. Mohs in 1938, involves removing one thin layer of tissue from the afflicted area at a time and examination of the tissue to check for the presence of cancer cells. If cancer cells are found, another layer of tissue is removed until the examination turns up a negative result. Once surgeons deem the area in question cancer-free, the surgery is complete. Unfortunately, this surgery can often require deep cuts into the skin, often on the face, that leave painful wounds and scars. 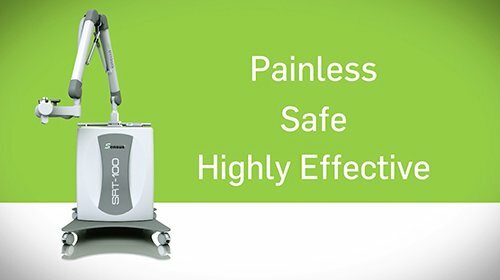 Sensus Healthcare offers a newer, more revolutionary treatment option: the SRT-100™. The treatment involves a precise, calibrated dose of Superficial Radiotherapy that safely and effectively destroys basal and squamous cell carcinomas. Here is how SRT therapy compares to Mohs surgery with pain, time, and results. When undergoing Mohs surgery, patients require anesthesia, and the operation calls for cutting into the skin. After surgery, the painful healing process can be lengthy, leave patients with significant scarring, and sometimes result in infection. SRT therapy is painless, and involves no cutting and no anesthesia. Mohs surgery can last for several hours; so expect long hours at the hospital or doctor’s office. SRT treatment sessions with Superficial Radiotherapy are more time efficient. Mohs surgery boasts a 99% success rate for new skin cancers and 95% for recurring skin cancers. SRT therapy success rates rival that of surgery at 95+%. If you’re interested in learning more about a quick, painless, successful alternative to Mohs surgery for your basal or squamous cell carcinoma skin cancer, contact Sensus Healthcare today.